If you are looking for a birthday party venue that is unique, fun, interactive, educational and promotes imaginative play, then the Brunk Children’s Museum of Immigration is what you are searching for! Children and adults alike will enjoy exploring everything from Vikings to visionaries. 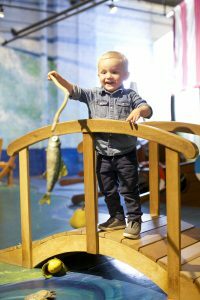 Play in our Swedish farmhouse and pioneer cabin, set sail on a steamship, take a journey to the Moon and much more! Parties include free admission to guests during the party, two hours of party time, private use of the classroom adjacent to the Children’s Museum, and a birthday party docent (two for private parties). Renters receive one half hour before the birthday party to set up and one half hour after to clean up. Have any questions? Please direct bookings and questions to 773-728-8111 ex. 26 or email the Children’s Museum. A $50 deposit is needed in order to secure a birthday party rental. Remaining balance is due the Friday prior to the birthday party. 12:30 p.m. – 3:30 p.m. or 1-4 p.m.
8:30 a.m. -11:30 a.m. or 3:30 p.m. – 6:30 p.m.
Want to add a theme to your child’s party? For an additional $5 per child, your party will include a craft and game for your guests. You may choose Pippi Longstocking, Viking or Pioneer theme. We also have goodie bags available for $5 each. Please call 773-728-8111 for more details and availability.